View topic - Estimating SMS Production Numbers from Serial Numbers - Forums - SMS Power! This was done for the Commodore 64 here, by applying the formula for the German tank problem to serial numbers. This is my attempt to do the same for SMS. I've been collating SMS serial & model numbers here, if you'd like to contribute you can also post in this thread on SMS Power. X: This was the manufacturers code. In 1986 1 (Japan), 3 (Taiwan), 5 (Taiwan), and 8 (Japan) manufactured SMS. These would occasionally get reset or reassigned as the manufacturers changed. Y: This was the last digit of the year of assembly. ie "6" = 1986, "1"= 1991 etc. Z: This was the production run, generally with different models being simultaneously manufactured starting in different codes. At first they usually started in 1, 5, or 8. When they ran out of numbers they started using upper case letters, then lower case letters. This system was also used by Mega Drive, with letters reserved for each model. After running out of letters the system was simplified in 1990/1991 (depending on manufacturer). With them adding an extra digit, and just starting at 0. SMSII (and a small number of very late SMS1s) use this simplified format. These batch numbers are unique per region, and for Japan and North America on SMS1, generally unique per model. The exception in North America happened when models were updated part way through a batch, but it's a very clear change, where models below a certain number are the old model, whilst model numbers above that number are the newer model, thus each serial number should be unique to just that console, and not just unique to the model number. For SMS II the situation is more complicated. The exact format depends on manufacturer. Only "B" (Japan) manufactured North American SMS IIs, and the pattern suggests that serial numbers from this manufacturer are only unique to the model number. Theoretically different model number can share the same serial number. With only one manufacturer, and two models, it's relatively simple to estimate North American numbers. For Europe/PAL the situation is a lot more complicated. With there being dozens of different model numbers I'll need more serials before I can estimate those. Still, in the meantime, here's my preliminary analysis of Japanese and North American serial numbers. Japan is really simple to estimate, only three batch numbers, and one model. I found the number to be surprisingly small. Unfortunately we don't yet understand the format used prior to SMS, so can't estimate Mark III numbers, which I suspect to be higher. These estimates could change slightly with a larger sample, but are unlikely to change significantly. That fits really well with the 1.8m figure that Tec Toy's Stefano Arnhold said. When they switched to newer models they didn't always update the model number immediately, so it would require working out which numbers have which bios to get a good estimation for a breakdown betwen consoles with bios v1.3 and v2.4 (Hang On/Safari Hunt). These make up the vast majority of units. For v3.4 (Hang On), and v4.4 (Missile Defense 3-D) it's a bit simpler. These only come from one batch number each. 485: Whilst these models start with 3010, before switching to 3010-B later, all of the 3010 ones that I've seen still contain bios v3.4. So an estimated 90,000 of those were produced. 48A: These are all 3010-C, so an estimated 60,000 with bios v4.4 were produced. SMS II: An estimated 90,000 US units, and 10,000 Canadian units were produced. They didn't even manage to sell all of those US ones in America, some of those ended up with the Mexican distributor. A small number of SMS1s were manufactured in 1990 and 1991 for Canada and Mexico respectively. Awesome, a shame not to have the PAL numbers though - maybe the number of variants suggests a large total number, as we'd probably expect. I found that on twitter recently, been meaning to post it. I don't know what the source is from may be wrong. Top claim to be HW sales, bottom 2 lines claim to be Software. I don't know which region. I am going to ask for model/serial numbers from the Japanese community and will post them on the other thread if I get any. I believe that those were GfK (a retail sales tracker who still tracks French video game sales) estimates, but I don't think they were very accurate back then as lots of video game sales weren't in consumer electronic stores that they tracked, but in toy stores and independent computer stores. We can get a good estimate for France for SMS II from serial numbers as it's the only country to use that model (similar for UK too), but for SMS1 it will be difficult to tease out sales per model as they seem (I need more serials to confirm) to have produced several different models in each batch. Thanks, the more we have, the more accurate the estimates becomes. I've added more serial numbers and recalculated the estimates, but it didn't change anything significantly. 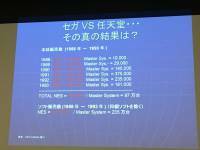 For Japanese Master System increasing the number of serial numbers from 51 to 65 changed the estimated total from 136k to 134k. For North American Master System increasing the number of serial numbers from 283 to 322 changed the estimated total from 1.75m to 1.74m. I think that we're pretty much there with those two regions, I'll take a stab at PAL regions soon.